The following are the four main Nigeria mobile operators: MTN Nigeria, Airtel Nigeria, Globacom, 9mobile. Asoko Insight, a consultancy, has studied these firms; I present a summary of the results. According to the Nigerian Communications Commission, the total number of mobile subscriptions stood at 237.6 million in January 2018. 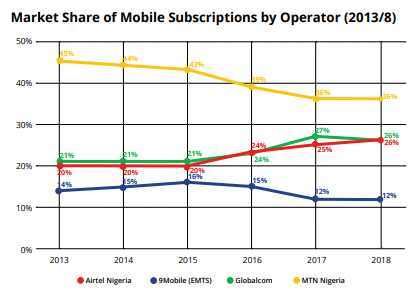 MTN Nigeria’s market lead has decreased in recent years; from 2013 to 2018 the company lost 6% of its subscribers. The company disconnected around 5 million subscribers in early 2016 following suspension of its services by the regulator. Meanwhile Globacom and Airtel Nigeria have seen steady gains: Globacom accounts for 38.2 million subscribers, up 47% from 2013, while Airtel Nigeria has 38.3 million subscribers, up 54% over the same period. Subscribers of 9Mobile (formerly Etisalat) declined going into 2017, on the back of the company’s debt default. 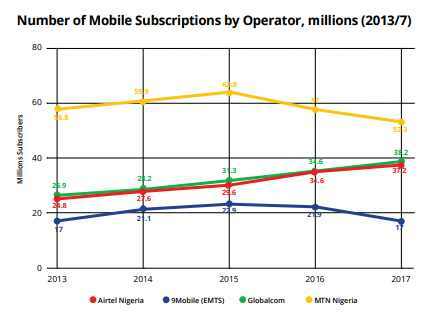 Nigerian Communications Commission data indicate that MTN Nigeria, the country’s largest telecom player, has seen a drop in market share since 2013, from 45% to 36% of total subscriptions in 2018. Smaller players have also seen shrinking subscription figures: 9Mobile (formerly Etisalat) lost 2% market across the same period. However, Globacom gained 5 percentage points during the same period, and Airtel Nigeria saw similar growth. 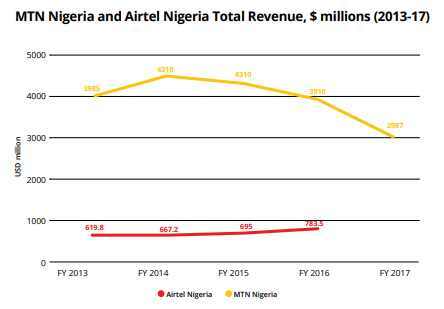 Airtel Nigeria’s total revenue increased by 22% from 2012 to 2016 reaching a high of $783 million at the end of the recorded period. (Airtel Nigeria 2017 revenue is unavailable.) MTN Nigeria’s revenue has been in steady decline since 2014, having fallen by 33.3% to reach $2.99 billion at the end of the period. Company statements identify the difficult economic environment, competitive data pricing, and regulatory uncertainty as the core drivers of the decline. Recent report suggests revenue is on the up going into 2018.